I’ve written recently about the changing landscape in public refrigerated warehousing, especially the cold food chain segment, and how PRW companies are expanding their services to be more competitive, more diversified, and more helpful to their customers. One of the services being offered more frequently by PRWs is tempering. Basically, it’s a well-controlled and closely monitored thawing and distribution process for frozen food products. Tempering is typically requested by purveyors and grocery companies that want to get certain frozen foods from a PRW to their refrigerated display cases — and to their shopper — in a thawed and safely refrigerated state. Following testing and risk analysis evaluations, we at Adams Cold Storage (ACS) brought tempering online as a new service in 2018. This past February it was included, for the first time (along with labeling), among the many review items in our annual and intensive certification audit against the BRC Global Standard for Storage & Distribution. BRCGS (formerly British Retail Consortium and now Brand Recognition through Compliance), is generally recognized as the “best practices” benchmark certification body in the food industry. At ACS, tempering primarily involves the proteins — pork, beef, chicken, turkey, sausages, and ground meats. The objective — ours and those of our shipper, distributor, and grocers— is to get the frozen products off our warehouse shelves and to the point of sale locations in a nearly-frozen state of 30 to 32 degrees. Final tempering takes place at the store so the products can be purchased in a thawed condition, with optimum freshness, and ready to prepare. Tempering varies slightly for each protein product because every product has a different density. Before we launched the service, some experimentation was necessary to perfect the process and ensure that all tempered products arrive at the store within a specified range of safe time and temperature. Tempering came about as an ACS service because some of our customers wanted us to consider this service and we always strive to grow with our customers. One of our customers worked closely with us to perfect the tempering timing and techniques, then signed off on the process. The proof is in the process, and our service delivery has been well-received and without issue. Circling back to the recent BRC audit, ACS came away with its third consecutive AA rating, the highest BRC rating possible, and the auditors found zero nonconformities. To say we’re pleased with the BRC audit results is quite the understatement. We’re very proud of our ACS team for its dedication to rate an AA status again, and we’re extremely grateful to our customers for the significant role they had in this achievement. Excellence in this line of work takes great company-customer partnerships, and we have those in scores here at ACS. 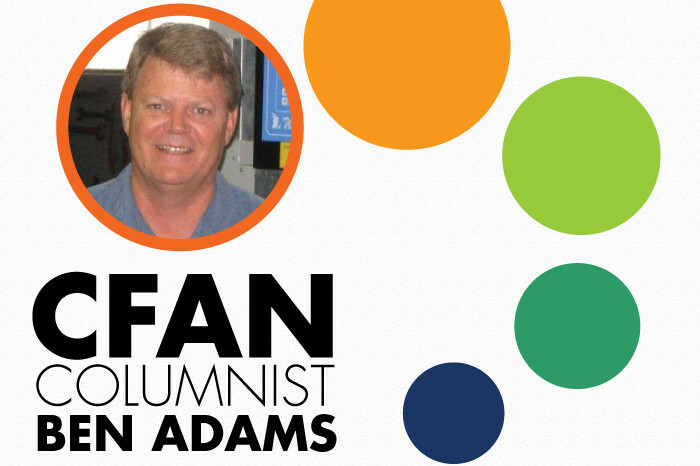 This column is sponsored by Adams Cold Storage, LLC, and the opinions expressed herein may not reflect those of CFAN or its advertisers. Ben Adams, Jr., is an owner and president of Adams Cold Storage, LLC, in Auburndale. He has been directly involved in citrus production, warehousing, and distribution, as well as state and community support, since 1980. His facility incorporates some 250,000 square feet of multitemperature warehousing, and is AA rated by BRC Global.